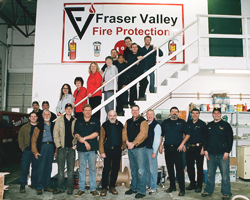 Company Profile - Fraser Valley Fire Protection Inc.
We know our business and how to protect yours from fire. Fraser Valley Fire Protection Ltd. has been in business since 1977 and specializes in all aspects of fire protection, fire suppression and emergency lighting system services. Our testing, inspection, repair and installation services reinforce our commitment to providing clients with the best in customer service, technical expertise and product quality. Fraser Valley Fire Protection technicians are certified by the ASTTBC (Applied Science Technologists and Technicians of BC) and some hold a membership with the CFAA (Canadian Fire Alarm Association). All of Fraser Valley Fire Protection technicians and licensed trades people are qualified and have the years of experience that results in quality workmanship. Fraser Valley Fire Protection maintains an active membership in the NFPA (National Fire Protection Association) and the MCABC (Mechanical Contractor Association of British Columbia). Fraser Valley Fire Protections serves the community and the Lower Mainland from its office in Abbotsford, BC. Our fire hydrant division, Fraser Valley Fire Hydrant Service, provides hydrant services and backflow services from our its Richmond location.